Welcome to the six hundred and sixty-eighth of my blog interviews with novelists, poets, short story authors, biographers, agents, publishers and more. Today’s is with novelist, short story author, poet and spotlightee Janet Kay. A list of interviewees (blogged and scheduled) can be found here. If you like what you read, please do go and investigate further. You can also read my spotlight with Janet. Morgen: Hello, Janet. Please tell us something about yourself, where you’re based, and how you came to be a writer. Janet: Good morning, Morgen. I live in the United States, on a pristine lake in the woods of Northwest Wisconsin. It’s a perfect place to write and to absorb the nature that surrounds me. Bear and deer stroll through my wooded yard. The sounds of waves lapping on the shore and loons wailing across the water are magical to me, as are the sunsets. All my life, since the tender age of eight, I’ve wanted to become an author. However, life got in the way of my lofty dreams – things like a demanding career and supporting my family. While I published numerous articles, short stories and poems over the years, it wasn’t until I took an early retirement that I was finally able to pursue my lifelong dream. Writing is my passion. I believe that novels should be transformational. I hope to make a difference in the lives of my readers, to expand their horizons in some small way. Morgen: I’d say about half the authors I’ve spoken to have always wanted to be a writer. I wished I had when I first had that answer but console myself that I had 38 years’ experience by the time I ‘discovered’ (evening classes) creative writing. Few have had the setting you have though, now that is something to be jealous of. 🙂 I’ve described you in the introduction as a ‘novelist, short story author and poet’ – what genre do you generally write and have you considered other genres? Morgen: Wow. Multi-genre for sure. As am I, although I’m concentrating on crime (and just back from a crime-writing weekend in Scotland :)). What have you had published to-date? 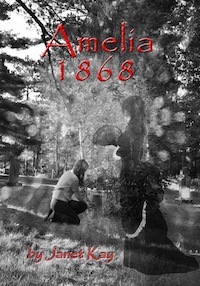 My new release, AMELIA 1868, is an intriguing paranormal historical novel set primarily in the old western ghost town of Virginia City, Montana. It flashes back and forth in time between the life of a hurdy-gurdy dance hall girl struggling to survive in the 1860s and that of an Iowa farm girl in 2011. Excellent reviews are coming in already. Amelia has been highly recommended by Midwest Book Review and nominated for a North East Minnesota Book Award. For more information about these novels, please check out my website at http://www.novelsbyjanetkay.com. Morgen: That’s fantastic. Feedback is so important (which is why I set up https://morgenbailey.wordpress.com/feedback and https://morgenbailey.wordpress.com/online-writing-groups), especially when it comes to book reviewers. I don’t review books but am often asked so have a list of some on https://morgenbailey.wordpress.com/reviews. It’s really all about word of mouth, getting people to know that you exist. You’ve self-published, what lead to you going your own way? Janet: Thank you for asking! I think this is an important question in today’s rapidly changing publishing world. As you know, landing an agent and traditional publisher is not easy for relatively unknown writers – even talented writers. And it takes time – more time than I was willing to devote to it. As I watched the old stigma of “self-publishing” begin to fade into the past, I began to realize the opportunities it provided. I decided to go with Create Space, an affiliate of Amazon.com. I was able to maintain control of my “baby” while earning greater royalties – and getting my books out there fast. It’s an excellent program that produces a quality product. For more information, go to http://www.createspace.com. I believe that life is too short to wait forever for a traditional publisher to pick you up. Morgen: It’s interesting that you say, “more time than I was willing to devote to it” because marketing is usually the answer to “What’s your least favourite aspect of your writing life” for that very reason. We’re writers, we should be writing. CreateSpace is paper books – are your books available as eBooks? How involved were you in that process? Do you read eBooks or is it paper all the way? Morgen: Most people do still prefer paper. I felt like that but bought a Kindle when I went away for a weekend and thought I’d have some free time (it turns out I didn’t but at least I was prepared), plus I was planning on eBooking some of my stories so wanted to see how they’d turn out. Although I’ve since sold my Kindle to a friend, I often read via the Kindle app on my iPad and am going to download Kate Atkinson’s latest book when it comes out (on the 14th) because I’m going to her book signing in Oxford on the 18th. She’s usually one of my answers to who I’d have for dinner and I’ve never met her so am REALLY looking forward to meeting her. She was kind enough to bring out her novel ‘Started Early, Took the Dog’ on my birthday (19th August 2011) and I’ve not read that yet (despite buying it on the day!) so will read that before the 14th. One of my New Year’s Resolutions was to read more and I’ve been really slack… until now. 🙂 What are you working on at the moment / next? Janet: Once I’ve launched my new novel, AMELIA 1868, with a book tour to Iowa and Montana where it is set, I will get back to writing. I have two projects in the works. One is a novel set on Galveston Island in Texas. The other is a sequel to Waters of the Dancing Sky that will be set once again, in the remote Voyageur’s National Park in northern Minnesota. My readers have been urging me to write this sequel. Some have even provided me with some great ideas for this book. Morgen: There can’t be anything better for an author than readers wanting more. 🙂 Do you plot your stories or do you just get an idea and run with it? Janet: A little of each… I do not do extensive plot outlines since the plot continues to change and evolve as I write. When I’m dealing with actual historical events, however, I write a detailed timeline to be sure my work is historically accurate. Morgen: One of the things I love about writing fiction is how the plot changes (and evolves, as you say), especially when the characters take over. Do you have a method for creating your characters, their names and what do you think makes them believable? Janet: I create character sketches for my primary characters. I need to know them well and understand their fears, desires, and background information. I think my characters are believable because they all have flaws and fears. They are human after all. People can relate to them and see themselves in my characters. It’s interesting to me that at some point, these characters seem to come to life. I’ve had them wake me up at night, demanding that I listen to them, trying to rationalize their behaviour in my novel. Yes, I do listen to them! Sometimes, I make changes to accommodate their requests. An example is my character, Rob, in Waters of the Dancing Sky. He’s not a nice man, to say the least. (In fact, my readers want me to get rid of him in the sequel!) Anyway, he kept coming to me in my dreams, urging me to soften his character and build in more background to justify his behaviour. I took his advice and wound up with a more believable character. Morgen: I love killing off characters, although it sounds like him being such a devil makes it great reading. Maybe you could kill him off in an even later book, although I suspect your readers may warm to him now and not want you to do that. Do you do a lot of editing or do you find that as time goes on your writing is more fully-formed? Janet: I firmly believe in extensive editing. While my writing is more fully formed as time goes by, I believe even more strongly in the value of objective professional editing. I revise and edit my own work through the first few drafts, I then send it out to a number of reviewers for their feedback and proposed changes. I incorporate much of that into the next draft before hiring a professional editor. I do not believe there is a writer alive who can edit his or her own work adequately. We all need the trained eye of at least one objective editor. Morgen: We’re always too close to our work, aren’t we. I do find reading out loud (and from paper rather than on the screen) does help… and also the power of the red pen. 🙂 Do you have to do much research? Janet: I do lots of location as well as historical research before writing my novels. This is important since I consider myself to be a “place writer” of destination novels as well as an historical novelist. Place becomes a character in my novels. I spend many weeks living in the places where I set my novels, interviewing people, pouring through historical books, hiking the streets, eating at the restaurants, boating on the lakes and getting to know wonderful local people. It is important to me that my settings are historically and geographically accurate. A number of my readers were so fascinated with Rainy Lake and Voyageur’s National Park (setting for my Waters of the Dancing Sky novel) that they are now booking trips to this area. Morgen: I know some authors who have chosen exotic locations just so they can do the research. 🙂 You mentioned agents earlier, presumably you don’t have an agent at the moment? Do you think they’re vital to an author’s success? Morgen: I’m sure it wouldn’t hurt, and I’d never say never. How much of the marketing do you do for your published works or indeed for yourself as a ‘brand’? Janet: I do most of my own marketing, utilizing social media such as LinkedIn, Twitter and Facebook as well as book tours. I also belong to a number of valuable marketing networks including Independent Book Publishers Association (http://www.ibpa-online.org) This is a great way to leverage your marketing dollars and promote your books to bookstores, libraries, book reviewers and at major book events including Book Expo America in New York City and the London Book Fair. Morgen: I’ve never been to the London Book Fair, despite living an hour and a half north of the city. That said I probably won’t this year as it’s 15-17 April and I’ve just signed up to do Camp NaNoWriMo and my writing has to come first (because it hasn’t for too long!). What advice would you give aspiring writers? Janet: NEVER GIVE UP! Do not be discouraged by rejection letters. They are a part of every writer’s life. Be true to your own voice and write the story you were meant to write. It does not work to imitate other writers. Writing can be a solitary activity, but you can join writers groups and organizations to network with other writers and support each other. I belong to a wonderful and very supportive writers’ group – The St. Croix Writers of Solon Springs, Wisconsin. Their critiques and encouragement have helped me to improve my writing skills and motivated me to pursue my writing dreams. Morgen: Absolutely. A writer should immerse themselves into everything writing. I do all the above (hence the trip to Scotland). Is there a word, phrase or quote you like? Janet: “I dwell in possibility…” Emily Dickinson. This, I think, is the essence of creative writing. Morgen: I love possibility. The fantastic thing about fiction (the only non-fiction I write is about writing) is that it can go anywhere… as long as it’s believable. Are you involved in anything else writing-related other than actual writing or marketing of your writing? Janet: I serve on the Board of Directors of our Wisconsin Writers Association. This is an excellent organization of writers in all phases of our careers. We offer contests, conferences, and an excellent support network. (http://www.wiwrite.org) Coming soon is our Novel-In-Progress Bookcamp, an intensive, week-long writing retreat for emerging novelists to work on their books, receiving feedback and assistance from experts in the field. Morgen: That sounds great. I list competitions on https://morgenbailey.wordpress.com/competitions-calendar and conferences (etc) on https://morgenbailey.wordpress.com/events so if you’d like to give me the specifics, I’ll gladly add them. What do you do when you’re not writing? Janet: When I’m not writing or reading, I can usually be found in or by the lake, hiking in the woods, travelling to places on my “bucket list” or spending time with family and friends. I also love photography, performing arts and classical music. Morgen: I love classical music. It’s the only thing I listen to when I’m writing because there are no words to interrupt me. My father was a photographer (my uncle still is) and designing my covers has made me think more about photography, so I’ve just joined a (sort of) local photography group on http://MeetUp.com. Where can we find out about you and your writing? 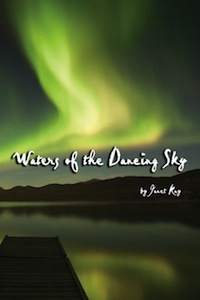 Janet: For more information, please check out my website – http://www.novelsbyjanetkay.com or http://www.watersofthedancingsky.com which includes a photo gallery and opportunities to enter contests I’m sponsoring to promote my novels. In addition, I have an author’s page on Amazon.com linked to my novels. It can be found by searching “Janet Kay” or “Waters of the Dancing Sky” or “Amelia 1868”. Morgen: “enthrals” I love it! Is there anything you’d like to ask me? Janet: Yes, why did you create this site to help authors promote their work? I think this is an incredible opportunity that you are providing for so many writers, and I thank you very much! Morgen: You’re so welcome, Janet. I created the mixed blog (https://morgenbailey.wordpress.com – I have others) as a sounding board really to put some of my work (my debut novel concludes on https://morgenbailey.wordpress.com/novel-nights-in next Saturday) and anything I spotted online but then I was invited to be interviewed (via email) on another author’s site which was so easy (compared with interviews I was doing for my https://morgenbailey.wordpress.com/bwt-podcast) so I started hosting interviews (which ended up having a 9-month backlog so I created http://morgensauthorinterviews.wordpress.com so I could run more than the one a day on the mixed site) and the rest developed from there. Thank you, Janet. I’m delighted you could join me today. In this intriguing paranormal historical novel, Wisconsin author Janet Kay will keep you turning the pages as you are drawn into a new dimension of life as we know it. Drawn to an old cemetery in the mountains, she discovers a weathered tombstone and begins to sob uncontrollably. Only two words are etched upon the stone – AMELIA 1868. Obsessed with uncovering the identity of this long-forgotten woman, Rose finds herself transported back and forth in time between the life of a hurdy-gurdy dance hall girl struggling to survive in the 1860s and her own sheltered life in 2011. Her strange journey becomes more complicated when a love interest materializes and throws her off balance. Her life becomes a bizarre dance twisting and turning between the past and the present. Can she find a way to move into the future? Janet Kay lives and writes on a lake in the woods of Northwest Wisconsin. She enjoys kayaking, taking her grandchildren zip-sledding, watching spectacular sunsets over the lake, and listening to the call of the loons. Deer and bear stroll through her yard, sometimes peaking into her windows as she writes at her computer. Drawn to nature since she was a child, she sees its wonders as a source of renewal, reflection, and connection with something greater than oneself. She is also drawn to the Victorian era and its fascinating history. This is reflected in her writing. Her lifelong passions include creative writing, travel, photography, and spending time with family and friends. She is very proud of her three adult children, their spouses, and her ten exceptional grandchildren. They keep her in touch with that inner child that all writers need to tap into in order to create their fictional worlds. 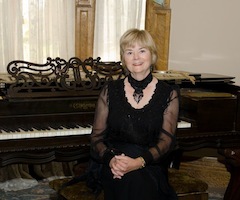 Kay is a member of the St. Croix Writers of Solon Springs, Wisconsin and serves on the Board of Directors of the Wisconsin Writers Association. She is also a member of the Alpine Artisans Writers Group of Seeley Lake, Montana; Lake Superior Writers; American Society of Authors & Writers; and Independent Book Publishers Association. Janet has had a number of articles, short stories and poems published over the years. She published her debut novel, Waters of the Dancing Sky, in 2009. It is an inspirational love story set on the wilderness islands of Rainy Lake, Minnesota. This novel continues to earn excellent reviews and has a five-star rating on Amazon.com. Anyone doing Camp NaNoWriMo this April?